We've just gotten out of Christmas and my bank account is still a bit under state of shock as I'm sure is yours. Which is why if there are going to be any gifts on Valentine's Day they must stand within budget reasons. So, just before you click off, here's a list of things that can be bought at different price ranges and they are good gifts for him and for her. Valentine's day is not just for couples, we do love other people and maybe there's that special person who deserves some extra pampering on this day. I would like to add though, that love should be celebrated every day and not just the 14th of February and these ideas can be taken to give someone a little surprise. A Card With a Nice Message - They always say it's the thought that counts. There is no sweeter thought than letting the other person know what they mean to you. It's always nice to read some good qualities other see in you once in a while. A Book - Books are not usually expensive. Maybe you know of a title that the other person has been eyeing for a long time. Writing a nice dedication on the first page and a good day made. Tickets - to a show/ Museum/ film/ concert...anything that they have been raving about and want to see. I've gone for this one this year and surprised my boyfriend with tickets for a concert that he has mentioned one too many times. (Yes, I have already given him the tickets because I knew he would probably buy them himself). Plan Something Together - The best give two people who love each other can give is spending time together. Plan something you've been waiting to do together for so long, like horse riding or spa day (I don't know). Maybe have dinner at a special restaurant that you don't usually go to or maybe just stay at home cuddling over hot chocolate, candles and a good movie. Whatever the activity, nothing beats the gift of quality time. 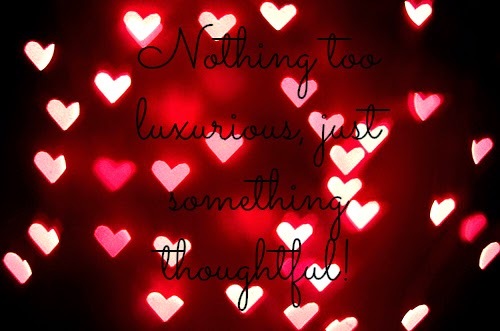 Nothing too luxurious, just something thoughtful!